3) Story Meetings in the future? The last workshop of our journalism skillshare series is on Tuesday! Hillary will send out an reminder email. David will bring snacks. The skillshares have generated a lot of interest. Shall we do more? Have the skillshares had been a success? They've been popular, but are we getting more more content on the site because of them? We decided it was worth doing more, as it gets the HMC out there, but will follow up with story meetings and longer workshops as a way encouraging people to post. Possibilities for more skillshares: Hillary will contact Dave Sparks to see if there's any interest for a skilllshare in North Preston. Radio journalist Janna Graham has also expressed interest in doing a skillshare. Hillary will contact her as well. The print skillshare could probably easily be done again in a new location. We also discussed the possibility of doing a weekend-long workshop, but decided that should wait for a few months. Hillary, Vivian and Glen will make a webinar about the print skillshare next week. 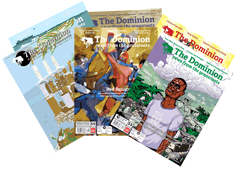 The Dominion is doing a membership drive in May. How can we piggy-back on that? - Have events in May. Vivian will look into a media panel. More skillshares etc. - Have big button on the website encouraging people to join.